Pie Tops are not the future of sneakers. They’re not some cool prototype like the HyperAdapt that point to a shoe company finally realizing a long sought-after feature. 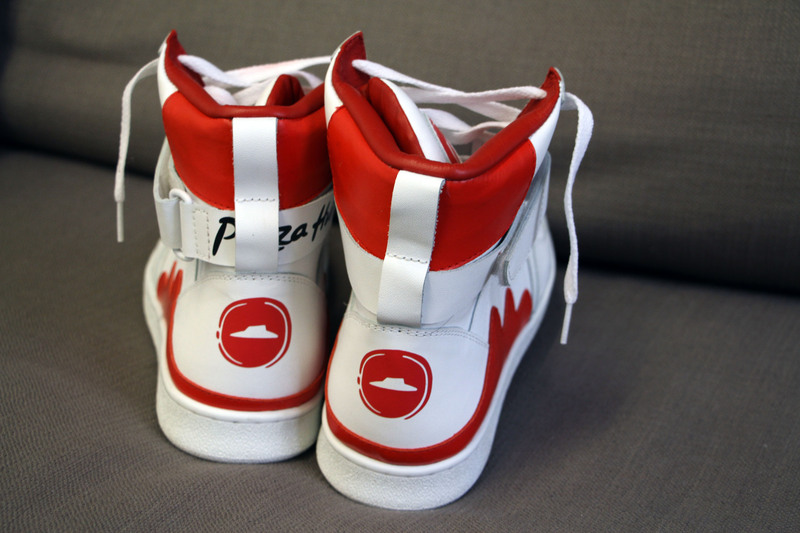 They’re a good gimmick from a pizza company looking for a way to capitalize on March Madness with a pair of shoes that order a pizza when you squeeze their tongue. I’ve tried them, they’re real (hand-stitched, no less, by “Shoe Surgeon” Dominic Chambrone) and I have the existential dread to prove it. The Pie Tops are part of an ad campaign starring retired basketball player Grant Hill, who, for all I know, eats a ton of Pizza Hut pizza. He probably still exercises a lot. I’m sure he has a pretty good metabolism for a 44-year-old. Even so, I have a sneaking suspicion he’s never complained about it being too difficult to order pizza. After all, you can order it from Twitter, Amazon Echo, Facebook Messenger — if there’s a technology, there’s a way to use it to order a pie. And now, if you’re one of a lucky few, you can do it from a pair of connected sneakers. The Pie Tops have a built-in Bluetooth radio that syncs to a mobile device with the company’s devoted app. When a user squeezes the right tongue once or twice (this can be adjusted in the settings to avoid accidental activation), it places an order for whatever style of pizza the wearer has saved in the app. Or, rather, it pops up a notification, which the user then has to unlock the phone to confirm. Which is to say, it doesn’t actually take any of the legwork out of the otherwise incredibly trying task of ordering a pizza through a mobile app. So, if you were hoping to have the way you transform pizza changed forever, bad news. Also, they don’t work in Manhattan. What they are, however, is a good gimmick. And a social commentary, perhaps, for the ways in which the conveniences of modern technology aren’t really all that convenient. Signing up for a Pizza Hut account, downloading an app, syncing a pair of Bluetooth sneakers, adding a credit card, bending over to press a button and then approving the transaction via an iOS notification really puts your life into perspective. What am I doing here? What choices have I made that led me to this moment? Am I so terrified of basic human interaction that I won’t call someone on the phone or even walk down a few blocks to the nearest Pizza Hut? Is there a comment box where I can tell the delivery person to ring the bell, place the pizza box on the front stoop and walk away so I can avoid human interaction altogether? Or maybe this is a commentary about the triviality of consumer electronics. Is the current race for wearable dominance really so different? At the end of the day, what’s the difference really, between the iterative updates that compel us to buy new smartwatches and fitness trackers and a pair of shoes that can order Pizza Hut pizzas? I’m not really sure I know anymore. There could be a glimmer of hope, in amongst all this existential dread. Maybe the Pie Tops represent the idea that technology, which has contributed to our sedentary nature and obesity epidemics, can help reverse the trend. Like Wii Fit and that stomach jiggling fat melting machine before it, perhaps there’s a faint glimmer of hope that the tech that has led us down this road can ultimately redeem us. It’s a lot to grapple with, particularly for someone who’s made their living writing about technology for so long, constantly covering the next new shiny distraction. It certainly puts a lot into perspective, regarding the bleak emptiness of our meaningless existence. But hey, at least we have pizza.